Many of the same principles underlie both Sustainable and Biodynamic farming practices. Sustainable farming rests on the principle of meeting the needs of the present without compromising the ability of future generations to meet their own needs. The Four Graces has undertaken a groundbreaking experiment: a direct comparison of two similar but distinct farming practices that resulted in the creation of two remarkable wines in the process. We've long been fascinated and inspired by the principles of sustainable growing – so we devised a way to test their results. 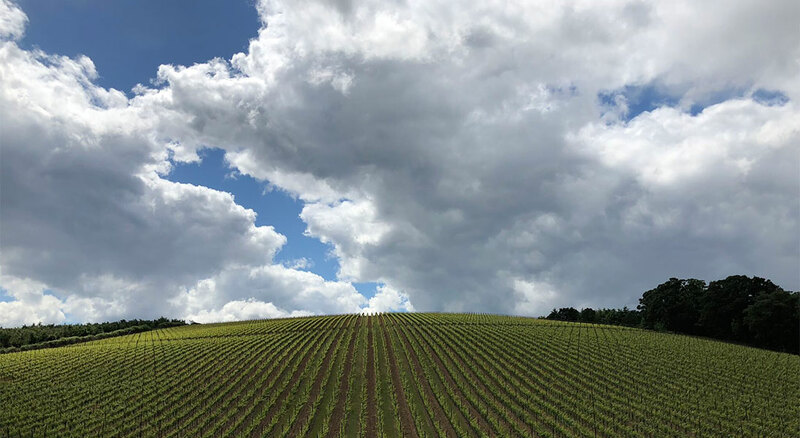 In 2005 we chose two 20-acre sections in our Doe Ridge Estate, side by side and with nearly identical characteristics of soil, light, altitude and other environmental aspects. Then we farm them, starting with identical stocks, using two different sets of practices: The North Blocks are farmed following sustainable practices, and the South Blocks are farmed following biodynamic practices. In 2008 we selected four barrels sourced from each section and aged them in French Oak for 18 months. The results of our grand experiment were finally available, although only 900 bottles of each wine were produced. And how did the wines turn out? Well, they're quite distinct from each other. Everything about these wines is the same, except for the farming practices – and that turns out to make a significant difference. We're allowing those who taste them tell us their perceptions of the wines and their differences. What are your impressions? Write and let us now at info@thefourgraces.com or post on http://facebook.com/thefourgraces. We don't know of anyone implementing a similar comparison on this scale, and we're proud to be at the forefront of exploring different environmentally positive farming methods. As we continue our fascinating experiment, we're eager to track the differences in these two wines, vintage by vintage. Many of the same principles underlie both Sustainable and biodynamic farming practices. Sustainable farming rests on the principle of meeting the needs of the present without compromising the ability of future generations to meet their own needs. Therefore, stewardship of natural resources is a primary consideration, meaning we must maintain or enhance this vital resource base for the long term. Use a biodiesel fuel blend in farm equipment. Biodynamics was developed by Rudolf Steiner, an Austrian scientist-philosopher, in 1924. Biodynamics treats the vineyard as a living organism, using a combination of organic preparations and the earth's natural cycles to grow balanced, healthy vines. Growing grapes following biodynamic farming principles mean working to bring the grapevine and the soil into balance. This is done through environmentally sound farming, using natural preparations and timing work processes with the celestial rhythms of the earth. While organic farming also uses compost for fertilization, biodynamic farming uses much smaller quantities of natural preparations to enliven the soil. These minute amounts of natural preparations introduce microbial life and nutrients into the soil, and that life reproduces throughout the vineyard. Make our own compost from local organic cow manure and straw which is available to irrigate the vineyard. The Doe Ridge Vineyard is destined to produce excellent fruit.